NORTHRIDGE, California – The 39th annual American Music Awards broadcast featured a star-studded lineup of artists, nominees and presenters including Taylor Swift, Jennifer Lopez, Nicki Minaj, Enrique Iglesias, will.i.am, David Hasselhoff, Christina Aguilera, Justin Bieber, Katy Perry, Kelly Clarkson and a host of others. Held at the Nokia Theatre LA Live on November 20, the American Music Awards (AMA) featured more than a dozen live performances, all heard through a sound reinforcement system comprised of HARMAN’s JBL VERTEC® line arrays. ATK Audiotek of Valencia, California has worked on countless television productions, special events, conventions, installation and concert tours. For the AMA broadcast, ATK Audiotek brought in an audio system that included 70 VERTEC VT4889 fullsize line array loudspeakers, 15 VT4887 compact line array loudspeakers and five VRX932LA Constant Curvature loudspeakers. In addition, more than a dozen JBL VT4880A fullsize arrayable subwoofers that were already installed in the Nokia Theatre LA Live were employed for the live broadcast. ATK Audiotek arranged the VT4889 speakers in eight clusters–four main arrays of nine, 10, 10 and nine speakers each, and four delay clusters of seven, nine, nine and seven each. In addition, five VRX932LA’s were placed under the balcony for additional coverage. 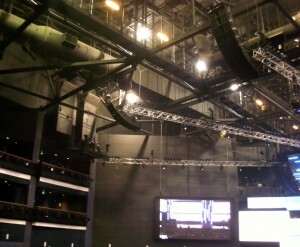 The VT4880A subwoofers that were already installed throughout the theater were used to support the low end.